Middle East, a verdant oasis of grandeur and opulence, comes across as haven of tourism with its blend of the modern and the ancient cultures and traditions. Situated at the meeting point of European, African and Asian continent, this region is of immense importance in world politics, history, geography and economy. In this way, Middle East possesses an interesting mixed bag of features from all the three surrounding continents yet stands out with its unique attributes. The common image that evokes in our minds with reference to Middle East is sparkling desert cities with golden minarets in the middle of a maze of gigantic stone structures. It goes on with men with profound headgears and women in all-covered attires walking past narrow cobble-stoned lanes. In reality, the Middle East nations do have a quaint charm about them with many forts, castles, mosques and towers doting around the landscape. However, in past few decades, the fast pace of modernism has caught up with this region and it has developed radically, though steadfastly retaining its old-world character. Today the Middle East nations boast of high-rise business properties, world-class highways, up scale suburbs rooted in traditional Islamic architecture, elegant mosques, large green parks, archaeological sites, museums and world-class hotels. Broad roads lined with well-manicured green lawns and profusion of multicoloured flowers have replaced squeezed up alleys. Still, a trip through the labyrinth of streets reveals many fine old houses with carved doors and arabesque windows that are reminiscent of the bygone era. The Middle East is also famous for its historical monuments, handicrafts and agricultural products. All the countries of Middle East have an expansive collection of ‘Souq’ or markets, showcasing a wonderful array of handicrafts. Elegant and exquisite coffee pots, swords, leather goods, silverware, antiques and household utensils are the major products of the region and prove to be any art collector’s delight. Here one can see fine examples of Islamic architecture with beautiful wooden inscriptions and paintings on the ceilings and intricate works on marbles. Moreover, Middle East also enjoys its share of natural beauty and ecological splendours. From placid seacoast town with its striking traditional dwellings by the Persian Gulf in Bahrain to the scenic backdrop of the Gulf of Oman, from shopping paradise of Dubai to holy pilgrimage of Jerusalem; Middle East has something in offer for everybody. If you are an adventure seeker, within the mountains of this region, you will be enthralled by the rugged networks of ‘wadi’ channels that have carved networks of dramatic canyons and caves. To pump your adrenalin rush further, go for sand skiing and driving or horse riding sessions with the gutsy Arab desert men. Or else you can enjoy the fabulous views of sparkling white beaches covered with multi coloured shells, deep ravines, cliffs that fall dangerously into azure seas, rocks sculpted by wind and waves and lush green ‘wadis’ or river beds. With so much of alluring offers and options, it is no wonder that Middle East is increasingly becoming an attractive tourist destination among the world's frequent travellers. 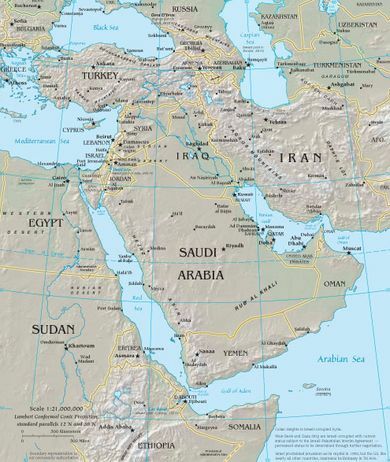 Geographically, sometimes it becomes difficult to chart out any particular details about Middle East due to its conflicting and controversial area demarcation. In broader sense, Middle East is not separate but a sub region of Asia that sprawls over the conjunction of Africa-Eurasia terrain. This denotes Middle East as a bunch of south-west Asian and north-east African nations. Following this theory, Middle East consists of Cyprus, the Asian part of Turkey, Syria, Lebanon, Israel, the West Bank and Gaza, Jordan, Iraq, Iran, Saudi Arabia, Yemen, Oman, United Arab Emirates, Qatar, Bahrain, Kuwait, and Egypt and Libya. However, other theories of demarcation leave out Egypt and Libya as North African nations only to include Afghanistan, Tajikistan, and western Pakistan among Middle East nations due to strong cultural, linguistic and historical resemblance. Situated on the western side of Afghanistan, Pakistan and India, the territories of the Middle East comprises of the Arabian, Anatolian and Sinai peninsulas that stretch from the Mediterranean Sea in the west to the Persian Gulf in the east. The topography of this region is basically barren or semi-arid with few exceptions of greenery and vegetations by the Mediterranean regions and amidst the oases and peninsulas. Among the Middle East nations, Saudi Arabia, Qatar, U.A.E., Oman, Yemen, Bahrain and Iraq are popularly addressed as the Gulf States. The reason for such reference is that all these nations are some way or the other, drenched by the waves from the Persian Gulf, Gulf of Oman, Arabian Sea, Gulf of Aden and the Red Sea. Syria, Israel, Jordan, Lebanon, the West Bank and Gaza Strip and Egypt's Sinai Peninsula come under the Levant region of Middle East. Levant signifies a region that rests at the south of the Taurus Mountains, bounded by the Mediterranean Sea on the west and by the northern Arabian Desert and Upper Mesopotamia to the east. However, the term is more cultural than geographical meaning the “land where the sun rises." Cyprus is the only island nation of the Middle East, situated amidst the Mediterranean Sea. The Iranian plateau is a major topographical feature of the region that is spread over Iran and parts of Afghanistan, Turkmenistan, Azerbaijan and Pakistan. This table-top land is bounded by mountain ranges from all side including the Alborz Mountains to the north, the Zagros Mountains to the west and the Hindu Kush range on the east. On the other side, Turkey comes under the Anatolian region of Middle East, which has been a cradle for several civilizations since prehistoric ages. In terms of historical journey and its enrichment with passage of time, Middle East can be regarded as the most treasured place on earth. From being the breeding ground of such ancient civilizations as Phoenicia and Persian and Babylon and Egypt, this is the holy ground where Judaism, Christianity, Zoroastrianism and Islam beckoned to enlighten the rest of the world. After the primitive civilisations of Mesopotamia, the Sumerians, Babylonians, Assyrians, Persians, Macedonians, Ptolemaic and the Seleucid established dynasties here. With the birth and spread of Christianity and Islam, Middle East remained witness to the greatest religious war in history, the Crusade. From the holy birthplace of Mohammed, Mecca and Medina to the epicentre of Christianity and Judaism in Jerusalem, this region is a huge conglomeration of cultures and traditions. The Turkish, Ottoman and Mongols have been the most dominating powerful races of this region. Middle East nations fought European forces successfully all through history and still maintain a cautious and cold relation with the U.S. and other "western imperialists” nations. Today, the countries of Middle East stay united under two common factors, Islam and crude oil. All the nations conform to a very orthodox form and ideology of Islam, with few exceptions like, Turkey and Cyprus where the environment is more relaxed and foreigners are warmly welcomed. Qatar, Bahrain and the United Arab Emirates are one of the most prosperous and successful economies of the world with huge stock of crude oil. Apart from oil supply, dry fruits, opium, handicraft, hand-woven fabric and tourism remain other major foreign currency earner for Middle East.